After years of fight and eight failed attempts over the last five decades, a historic day for India as it took the much awaited step of enacting the Lokpal law, which would establish an anti-corruption watchdog that will have in its purview even the office of the Prime Minister. The bill which was already passed by the Lok Sabha in December 2011 was sent back to the house to make certain amendments before being approved by the Rajya Sabha, and was in pending status in Rajya Sabha since last two years, was finally passed by voice vote. With UPA and NDA both supporting the present draft, the Lokpal and Lokayukta Bill, 2013, is all set to become law. Finally, a landmark anticorruption law will come in to effect, after decades of debate as to whether the country needed a national watchdog to investigate allegations of graft made against public and elected officials including the prime minister. Before the proposed legislation enters the statue book, it would have to be approved by the President to become a law. The bill, known as the Lokpal and Lokayuktas Bill which proposes to set up an independent ombudsman at the national level with parallel anti-graft agencies in states with powers to prosecute politicians and civil servants suspected of corruption, was first debated in the 1960s, and since 2011, has been a legislative priority, when Gandhian social activist Anna Hazare began a mass movement calling for a Jan Lokpal. The aim of this bill was to keep a check on corrupt practices in all agencies and authorities in the country, including the , the civil service, elected officials and even the prime minister’s office. Indefinite hunger strikes were undertaken by Mr. Hazare to urge the government to accept his version of the anticorruption watchdog bill. Morarji Desai led First Administrative Reforms Commission in the year 1966 recommends setting up of Lokpal at Centre and Lokayukta in states to look into complaints against public functionaries, including MPs. In the year 1968, the Lokpal bill was introduced before a Parliamentary committee for review, but it was decided by the committee that the prime minister will be kept out of the purview of the bill. A revised version of the bill was introduced in the Lok Sabha in the year 1969, with the lower house of Parliament passing the legislation but Rajya Sabha, the upper house, did not take up the bill for discussion. The bill was again introduced in the Lok Sabha in the year 1971, and this time minor changes were made to it. The Lokayuktas or watchdog bill was already implemented at a state level, by few states but yet again, the bill failed to cross all obstacles before the session of the national Parliament ended. The bill was re-introduced six times between 1977- 2011 in the Parliament but due to lack of consensus, it was not passed. For the first time, in the year 1989, the prime minister was brought under the bill’s jurisdiction when V.P Singh was serving as the prime minister of the country. The initiatives received momentum when the Social activist and anticorruption crusader Anna Hazare began fasting at central Delhi’s Jantar Mantar in April 2011, soon after a month of meeting Prime Minister Manmohan Singh to discuss engaging people from outside government to help draft a bill to set up an anticorruption ombudsman’s office. The fast however lasted for three days as the government decided to form a joint panel of ministers and civil society activists to draft the bill. June 2011 saw the government and Anna Hazare ‘s team presenting their versions of the bill, but sadly no consensus was reached. On June 30, a draft of the bill was presented before India’s cabinet. In July 2011 the draft bill which did not have jurisdiction over the prime minister was sanctioned by the cabinet and amid widespread protests by anticorruption protesters since the scope of the law did not extend to the prime minister, the bill was still introduced in the Lok Sabha in August 4, 2011. On December 27, 2011 the Lok Sabha passed the Lokpal and Lokayuktas Bill with certain amendment which was introduced in the Lok Sabha on the 22nd December, 2011. However, Rajya Sabha opposed to the bill during the session. After the approval of the Rajya Sabha’s select committee, on September 2012, the bill was shortlisted for consideration and passing however lawmakers failed to pass it, which was again on the agenda of the winter session but, its status remained the same. In January 2013, a version of the bill that kept out of its purview religious and charitable institutions aided by the government was sanctioned by the Cabinet. However, lawmakers didn’t manage to pass the bill again, during the three-month-long session. Finally, on December 18, 2013 the Lokpal and Lokayuktas Bill, 2011 was passed by the Parliament. 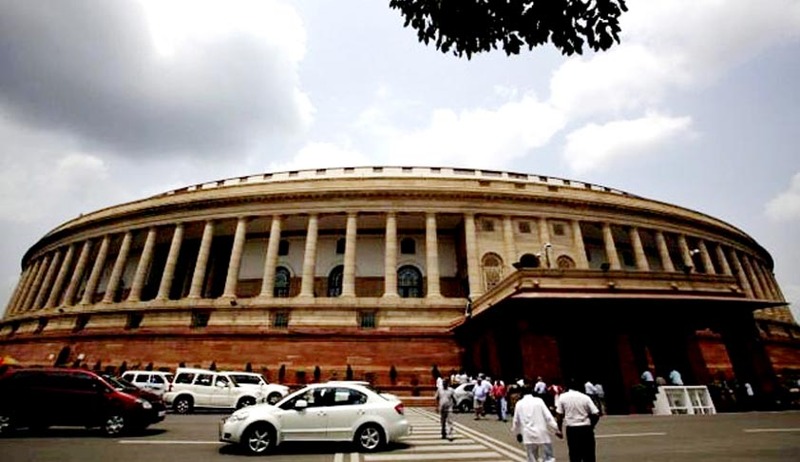 The Bill, as passed by the Lok Sabha, was taken up in Rajya Sabha which adopted a Motion that the Bill be referred to a Select Committee of the Rajya Sabha, for examination of the Bill. The Committee presented its report on 23rd November, 2012. The Rajya Sabha passed the Bill, 2011 on December 17, 2013 and it was passed by the Lok Sabha on December 18, 2013. 1. Lokayuktas: According to the new bill, it is mandatory for states to set up Lokayuktas within 365 days. States have the freedom to determine the nature and type of Lokayukta. The old bill said the law shall be applicable to states only if they give consent to its application. According to the old bill the central government was given the power to appoint state Lokayuktas while the new draft gives this power to the states. 2. Constitution of Lokpal: The Lokpal will comprise of a chairperson and a maximum of eight members, of which fifty percent shall be judicial members. Fifty percent members of Lokpal shall be from among SC, ST, OBCs, minorities and women. According to the older version, the Chief Justice of India or a present or former judge of the Supreme Court or a non-judicial member with specified qualifications (chief justice or a judge of a high court) will be the chairperson. 3. Selection of Lokpal: Prime Minister, Lok Sabha Speaker, leader of the opposition in Lok Sabha and the Chief Justice of India will be in the selection committee. The President will nominate a fifth member of the selection committee for selection of Lokpal under the category of "eminent jurist", on the basis of recommendation of the first four members of the selection committee. The old bill left the selection of the fifth person entirely to the President. 4. Religious bodies and trust: Societies and trusts that collect public money, receive funding from foreign sources, and have an income level above a certain threshold will be included in the new bill and it leaves out bodies creating endowments for or performing religious or charitable functions. As per the old bill, definition of public servant was given a wider meaning by bringing societies and trusts which receive donations from the public (over a specified annual income) and, organizations which receive foreign donations (over Rs 10 lakh a year) within the purview of the Lokpal. 5. Prosecution: In the new version, the Lokpal may authorize its own prosecution wing or the concerned investigating agency to initiate prosecution in special courts before taking a decision on filing a charge sheet in a case upon consideration of the investigation report. The old bill said only the prosecution wing of the Lokpal can prosecute the case. 6. Central Bureau of Investigation: In the new bill a directorate of prosecution will be formed for independence of the CBI. As per the recommendation of the Central Vigilance Commissioner, the director of prosecution will be appointed. The old bill said transfer of officers of CBI probing cases referred by Lokpal will be only with the approval of Lokpal who will also have superintendence over CBI in relation to Lokpal referred cases. 7. Hearing: The new bill says before a decision is taken by the Lokpal, a government servant will get a hearing. 8. Prime Minister: The Lokpal Bill will include in its purview, the Prime Minister with subject matter exclusions and specific process for handling complaints against the Prime Minister. 9. Investigation: Within 60 days inquiry has to be completed and within six months investigation to be completed. Only after hearing the public servant can Lokpal order an investigation. 10. Penalty: For false and frivolous complaints there will be imprisonment up to one year and a fine of up to Rs.1 lakh. Imprisonment for public servants is up to seven years. For criminal misconduct and habitually abetting corruption there will be a jail term up to 10 years. Any citizen can complain to the SC seeking removal of any member of Lokpal. Investigating machinery: The Lokpal would have to get the complaints investigated by any investigating agency, including the CBI, all of which would continue to remain under the administrative control of the government. The transfer, postings and post-retirement jobs of CBI officers would be under the control of the govt, thus compromising the independence of the investigative machinery. The CBI will be brought under the administrative control of the Lokpal, so that the investigating machinery can be made independent of the government. Whistleblower protection: Not mentioned in the government’s bill. The Jan Lokpal Bill includes provisions for protection of whistleblowers. The Jan Lokpal instituted a mechanism for prosecution of government officials if they failed to fulfill their duties under the citizens charter, which was to be created in this Bill. The Jan Lokpal bill sought to create a Lokayukta along the same lines as the one at the center. Frivolous Complaints: Any person making a false or frivolous complaint could be jailed for up to 1 year, which will deter even honest complainants from going to the Lokpal. There was a penalty up to Rs. 1 lakh, but no provision for imprisonment. Ambit of the Lokpal: Judiciary excluded completely and MPs excluded in respect of their votes and speeches in Parliament. Included all public servants, including judges and MPs, with regard to all their public duties. Rituparna Duttaa is Associate Editor at Live Law.